We already know how tiresome grooming our pets can be. Every activity involved in it is arduous and can prove quite challenging. To ease the burden, manufacturers have created different devices that take on these tasks. Be it hair trimmers or nail trimmers, these tools have made grooming less onerous. And one such device is the dog hair dryer. We need to wash out dogs regularly. The benefits to these go beyond just making them look good. A clean dog is a healthy dog. But what do we do after they come out of the water? Does the job end right there? The answer is no. Dogs tend to gather more dirt when wet than when dry, that’s a fact. If we allow them to simply run off with wet coats, they end up dirtier than they were before the bath. Also, when left wet for a long time, the dogs’ fur emits a stench that causes a great deal of discomfort. Therefore, we need a quick and simple way of drying our pets. This is when a dog hair dryer comes in. Owning one will reduce the drying process to just a few minutes, leaving your dog feeling fresher. So, what is the best dog hair dryer to buy? Good question. The best dryer must be portable and durable. These two features are not mutually exclusive. You can have a dryer that is lightweight but still strong enough to withstand heavy use. The strength is determined by the build of the body. Stainless steel is a good, inexpensive material that is commonly used. It’s also durable, meant for heavy use. Second, ask about the motor. A good motor should be about 3.5 to 4 HP. It should be able to eject hot air at a reasonable speed, one that isn’t uncomfortable for your pet. Also, the dryer needs to be easy to operate. To help you choose the right dryer, we’ve condensed all the choices available to a list of five of the best. Let’s jump right into our reviews. First on our list is the Free Paw Force Hairdryer. A great device that’s made to work for your pet, it’s well built for its purpose. For a pet dryer, it’s quite compact. The Free Paw measures in at 16.9 inches along the length, 10.6 inches in the width and a 10.6 inches in height. Underneath, to keep it stable on the work surface, the dryer has rubber feet. On top of it, there’s a handle attached to it. This makes it easy to move the Free Paw Dryer around. And weighing in at just 10 pounds, carrying it shouldn’t be much of a problem. Sticking out of its nose is a flexible hose that extends to a length of 94.5 inches. At the opposite end of the hose, a nozzle attaches. With the Free Paw, you get four different nozzles. There’s a 7 finger nozzle which is perfect for large dogs with thick coats. 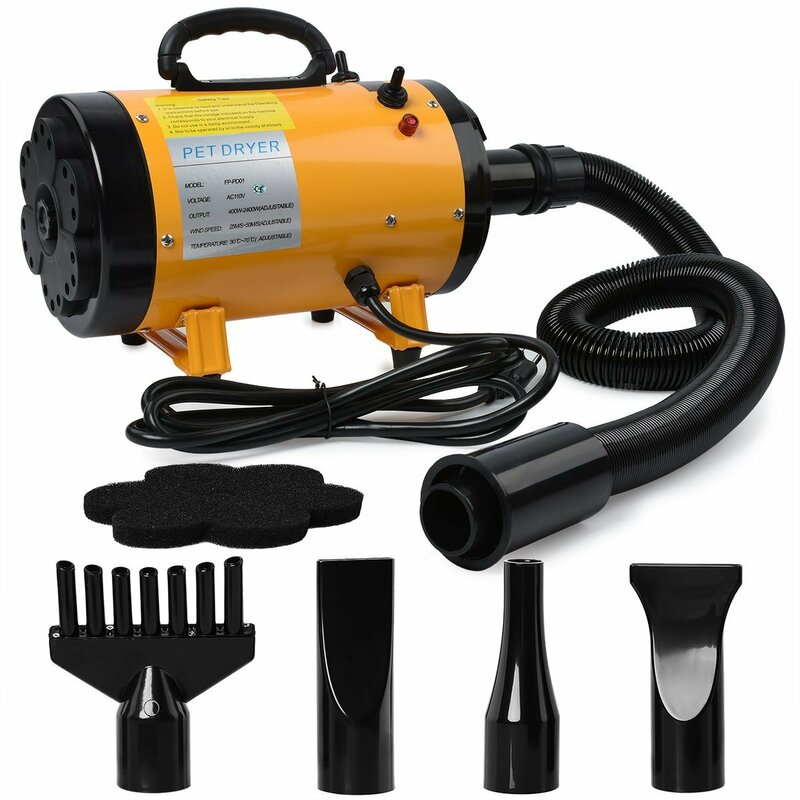 There’s also a slot nozzle which is best for drying the coats of both large and small pets. You also get a cylindrical nozzle in the package. Powering the device is a 3.2 HP motor under the hood. It gives the dryer the capacity to shoot air out at a speed of 25 meters per second to 50 meters per second. Depending on your application, both speed settings work superbly. The temperature is also adjustable. You get two settings of 96 degrees Fahrenheit and 158 degrees Fahrenheit. These are warm enough to dry your pets in the shortest time possible, but not too hot to cause them discomfort. Though the motor is powerful, it’s kept silent thanks to a special noise muffling sponge. This keeps the noise down at just 78dB. 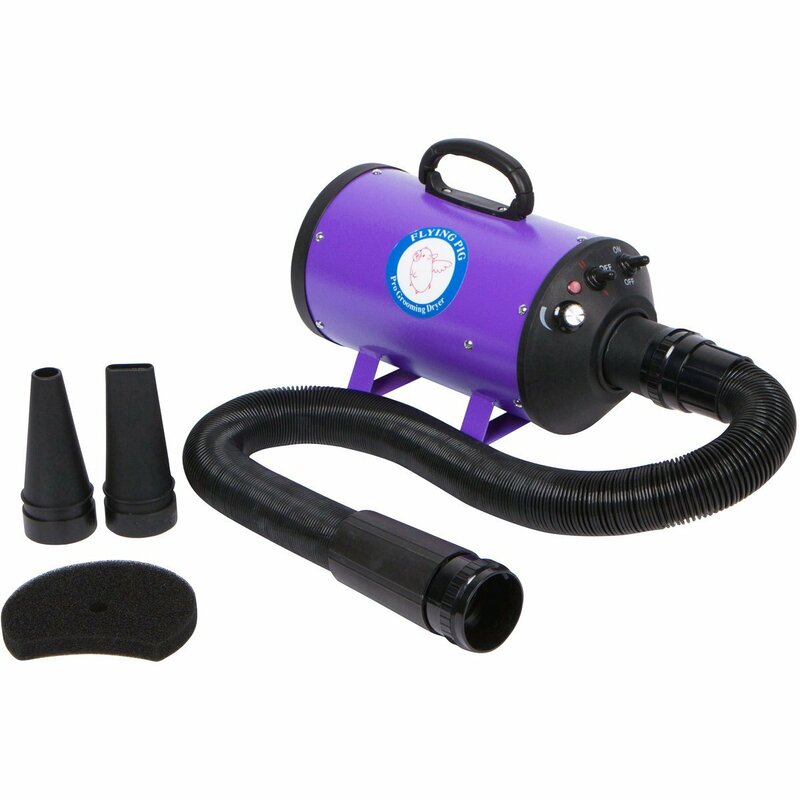 Another one from Free Paws, this one is a High Power, Stepless pet dryer. From a distance, it bears a similar look to its sibling we’ve reviewed above. However, the main difference is the color. This is your first clue that it’s a different model. 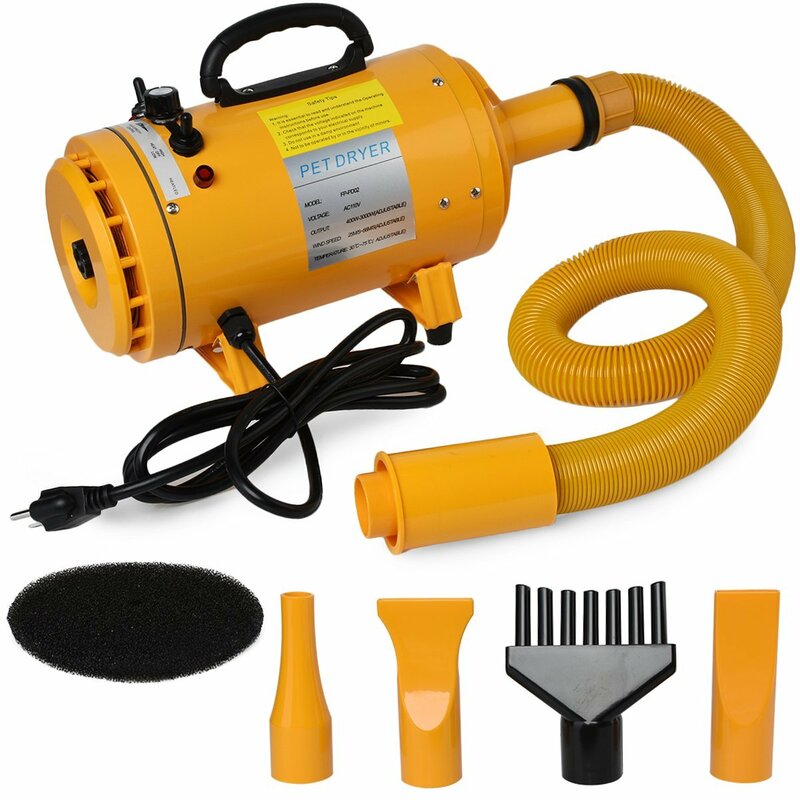 The body and hose are all yellow, making this Free Paw dryer highly noticeable. The dimensions are similar to its sibling; 16.9 inches by 10.6 inches by 10.6 inches. This model, however, has a little more weight coming in at 11 pounds. On the feet, the device is wearing rubbers that enhance grip on the surface it’s placed on. The device uses the standard AC 110V to gets its power. This gives life to the powerful 4 HP motor within which in turn produces an output power of 400 to 3000W. With this, you get two-speed settings of 25 M/S and 56 M/S shooting out of the hose. The temperature settings are also two; 96oF and 167oF. These temperatures are optimum, ensuring your pet remains comfortable throughout the drying ritual. Despite the power of the motor, its noise is muffled inside by the noise-canceling sponge. This maintains the sound at 62dB. Keeping with the standard Pet Hairdryer design is this one from a company known as the Flying Pig Grooming. It comes in different color options; purple, pink and green. Everything else looks familiar. Whether it’s the handle attached on the top side of the body or the rubber feet underneath, this dryer bears a striking resemblance to its competitors we’ve reviewed above. And just like its counterparts, it comes packed with all the necessary features that give it total functionality. The Flying One measures in at 16 inches along the length, 9 inches in the width and 9 inches in height. And with a weight of 11 pounds, carrying it around isn’t an arduous task. The flexible hose extends to a length of 10 feet, perfect for using from a distance. The heart of the dryer, the motor, is a powerful 4.0 HP. This allows the dryer to shoot out air at a speed of 140 Meters per second. It has two temperature settings; low and high. The low temperature is 81F while the high setting raises this temperature to 160F. To cap it all, you get two different nozzle attachments that ease the drying process. Use the preferred nozzle depending on your dog’s size and the hair type. Go Pet Club come in next with their iteration of the pet hair dryer. This device is clad in black with a compact build. Made of stainless steel, the body is strong enough to endure the daily bustle of pet hair drying. It’s made with strength and durability in mind. Measuring in at 15 inches along the length, 9 inches in the width by a height of 6.5 inches, it’s relatively smaller than its competitors in this list. It bears a weight of just 10 pounds and coupled with the sturdy handle on top, moving the Go Pet won’t be a hassle. 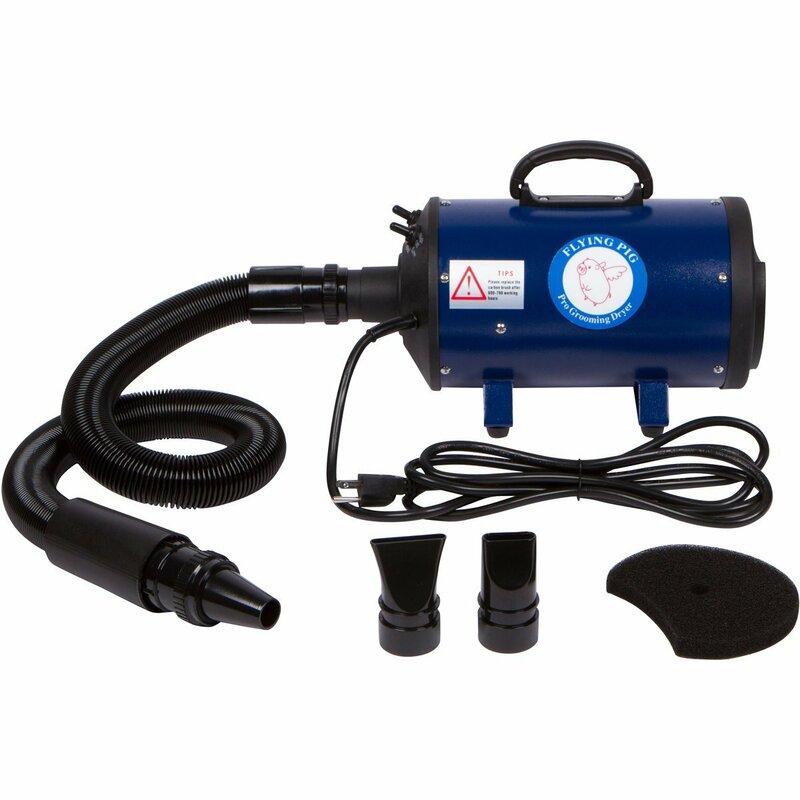 Under the hood, there’s a 4 HP motor which gives an output power of 2400W voltage. With this, the Go Pet is able to shoot out air at a speed of 25 M/S in the low setting or 50 M/S in the high setting. The temperature settings are two as well, the low one being 30oC and the high setting being 70oC. With the device comes three different nozzle attachments that ease the drying process. No matter your dog type, with these attachments you’ll be able to get your pet’s fur dry in no time. Closing our reviews is the dryer from Flying Pig Grooming, the Simple Force Dryer. It comes clad in navy blue. The handle is a sturdy build, attached to the body at the top. Underneath, it has rubber feet that give it a firm and stable grip on the surface it’s placed onto. This Flying Simple dryer has a weight of just 10.8 pounds. This bolsters the portability aspect. And with the handle, moving the device is a piece of cake. Right at the top, there are two switches. One of these adjusts the speed while the other is used to regulate the heat level. The hose, stretching out from the dryer’s front has a total length of 120 inches which is much longer than the average size. Within the stainless steel body, there’s a powerful motor that easily blows out a gust of hot air through the nose. At the very tip of the hose, you can connect a nozzle from the three that come with the device. There you have it, the five best pet dryers in the market. These five, score highly in functionality and durability. However, they are quite simple to use, making them ideal for anybody with a pet. And they can be used on dogs of any size with whatever coat. Still, we are duty bound to identify the one that edges past the rest. True, the competition is stiff. However, there is one that rises above the rest. 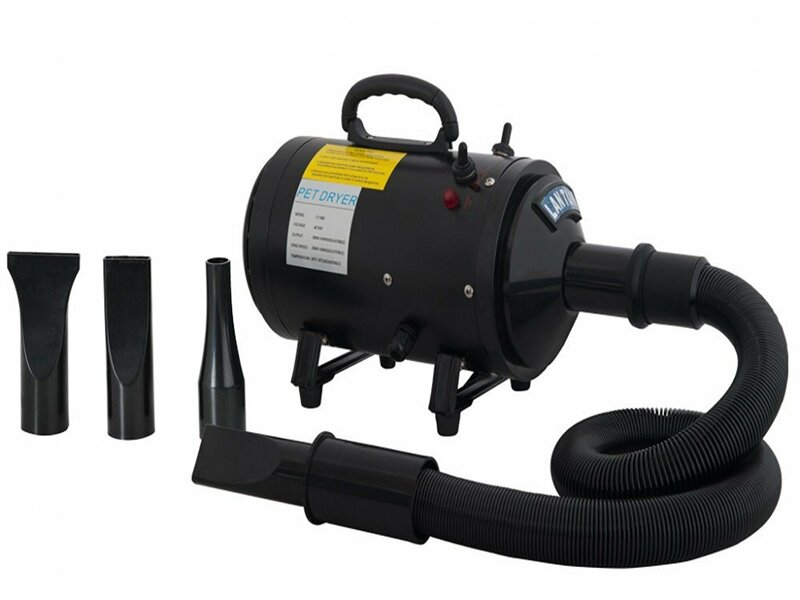 This is the Pet Dryer that is easily operated but offering a tremendous amount of functionality. It comes with a variety of nozzles that can be used on dogs with varied coats and of varied sizes. The best part is, it’s highly affordable. 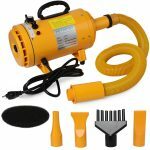 The best dog hair dryer is the Free Paw Pet Grooming Force Hair Dryer.